This year, my husband decided to commute to work again — on his bicycle. He's not alone. The number of people commuting by bike has increased every year since 2009, according to the U.S. Census Bureau. Back then, it was just over 687,000 Americans that biked to work. By 2014, the figure had climbed to more than 832,000. What's surprising is that the number of active commuters has never even reached 1 percent of the commuting public given how difficult it's been to make a living during the same period. In our case, Terry's commute is 35 miles round trip. So using the IRS standard mileage rate for business miles driven (down to $.54 cents in 2016), taking the car to work for 240 days of the year would cost $4,536. Add to that the parking fees of $26 a day. That's another $4,320 annually if we opt for the $360 monthly rate. It's hard to swallow $8,856 for annual transportation costs when the League of American Bicyclists estimates that commuting by bike costs a mere $308. Really. Even though you can save a tremendous amount riding to work, it still costs quite a bit to get set up. Especially if you're just starting out and have to buy a bike or even get new gear, these expenses can really whittle down potential savings if you're not careful. Visit every bike store you can. There are thousands of bike stores across the nation. When you go on a trip, even if you just go to a nearby county, keep your eyes open for new shops. Stop in, talk to the salespeople, ask about prices and if there are any deals. Scour Craigslist and eBay. Every day, new listings come up for bikes, frames, gear clusters, saddles, brakes, pedals, panniers — literally every accessory you might need for biking or commuting. As you shop at local bike stores, you develop a sense of the retail price of each of these items and can spot a deal more easily. Read reviews online. It really helps to read the online reviews when you've decided on a particular item. Other commuters are really generous about their experience with a product, so you get a better idea of what to buy and what didn't work for others. You might also find the best place to buy something, too. Sign up for online stores' newsletters. Some online retailers give their customers advance notice of upcoming sales. If you're looking for a specific item, you can score some pretty good deals this way. Drive a hard bargain. If you've done all this shopping and searching, you're less likely to be overcharged — but you might also be able to push a little bit to pay even less. For example, Terry wouldn't have found his current bike, Flame, if he hadn't asked a local bike shop clerk if they had any bikes in his size for less. It turned out that a new bike had recently been returned. Apparently, the original owner decided it wasn't the right size for him and traded it back in. It was just a frame. Brand new, it would have cost about $1,200. The store started out offering the frame and fork for $600 knowing it would be hard to sell a now-used frame in a size that wouldn't fit most people. Luckily, Terry is tall, but he still worked to get the price down to what he could afford, $375, since he also had to buy the rest of the components to build the bike. You can save anywhere from $300 to $1,000 on a bike frame. But if you don't know a lot about bikes, if you're not a bike mechanic and wouldn't know how to rebuild a bike, it's important to talk to the salespeople about what you're hoping to do. Take different bikes out for a test drive and see what's comfortable and what you like. Start to understand the brands and various components of the bike — and make note of the brand name, model, and retail price you'd have to pay brand new. But go to a lot of bike stores, not just the one down the street. Then search for those brands and components on Craigslist or eBay, too, just to see what you can find. Do this over a period of months to get a broad base of knowledge about the bike frame you want so you can spot a deal when it comes up. Keep visiting different bike shops and talk to people, asking them to contact you if any deals come up. Be careful about online purchases. Make sure you can actually go see any frame you're interested to buy. The frame needs to be capable of having the latest equipment on it, so it needs to be newer (not older than 10 years old) because otherwise the new components won't work on it. You want to make sure to get a recognized brand. Custom-made frames sometimes use off-standard sizes and which means you'd need specialized components just for those frames. Look out for used carbon fiber frames. Carbon fiber frames hide their damage better than most aluminum and steel frames. And a damaged carbon fiber frame — or a fake frame — could literally come apart on your ride someday. Fake carbon fiber frames are difficult to spot unless you really know a lot about how they are manufactured. Authentic carbon fiber bikes typically have serial numbers that you can trace with the manufacturer. Get to know where to find the serial number and check it online with the manufacturer. Don't buy it if it's not listed with the manufacturer! If you're in doubt, take a qualified bike mechanic with you. Depending on the type of bike and your preferences, a new drivetrain can cost from $300 to over $1,000. The drivetrain includes the pedals, cranks, chainrings, chain, cassette, and the derailleur. (For example, a basic Shimano drivetrain group set, like Tiagra, runs about $325 brand new.) On Craigslist, you can find a used drivetrain group set for something like $250. Commuters might want to consider a $300 to a $700 set because of heavy use, but in general, you can save from $150 to $500 or about 25 to 50 percent. When it comes to replacing drivetrains and other components of your bike, the saying “your mileage may vary” definitely applies. These are estimates, of course, but a cassette is usually good for about 5,000 to 8,000 miles depending on how well you take care of it. The chainrings are good for about 8,000 to 10,000 miles. Bottom brackets and shifters are about the same, 8,000 to 10,000 miles. Basically, most of the components should last between three to five years, except for the rear gear cluster which would last anywhere between two to three years depending on how many miles you ride and the conditions. A good saddle may last 20 years, and a Kmart saddle may only last a year or less. It is really a matter of comfort, and you'll want to try different saddles at a bike store and have them measure you. Here again, you can learn a lot by talking to salespeople and reading reviews online. When you find a saddle that is comfortable and works for you, start looking online at Craigslist or eBay. Terry bought his Selle Evolution SMP for $75 from someone through Craigslist. It sells for $192 to $274 brand new. I ended up changing my saddle after a few years, too, and we found one for $60 through Craigslist — but new, it sells for $95 to $125 depending on the color. You can buy brake pads, tubes, tires, chains, and cables at local bike shops very easily, but it's great to find a bargain for them because you're replacing them a lot. This is where signing up for emails with online retailers pays off. Try to stock up on tubes and tires when you get word of a sale from a major bicycle parts supplier. For instance, Terry bought four tires from Western Bike Works at $37 apiece. Normally, they run $75 apiece. But he also monitors other stores because sometimes a store runs a sale right after another store's sale ends. We just visited a new local bike shop and learned that they sell tubes for $7 apiece, which is a dollar less than any other store we've seen. Jensen USA, based out of Los Angeles, stocks hard-to-find bicycle parts too. On the rest of the stuff, if you want to upgrade something, look on Craigslist or eBay to find replacements. Typically, you wind up paying about 25 to 50 percent less than what it would cost new at a store. We always buy our bike clothing new — but we look for sales. Like our Showers Pass Elite 2.1 rain jackets sell for $249 each, but we pounced on a sale and bought them for $137 each. Lights, panniers, backpacks, mirrors, and tools can also be found on sale or on Craigslist or eBay. Always read reviews about these items to find the best product at the best price. Somewhere down the road, you may decide you want to try a different saddle or drivetrain. Obviously, try to find your best deal first. Then once you replace the item and decide to keep it, sell the old, used item to get whatever you can and defray your costs. It's important to give people the best information about the condition of the parts you're selling so they can make a good decision about what they're buying too. That's what we want when we purchase someone's used item, and so we do the same whenever we sell something online. Sometimes people find that a new item doesn't work for them for some reason, and they've already gotten something they like better and just want to get rid of the first item as quickly as possible or get something for it at least. That was the case with both of our saddles. Terry's had his bike since 2001, so our outlay so far this year to get him ready to commute was closer to $500 for a waterproof backpack, two new rims, heavy-duty gloves, and a rain cover for his helmet. We're not taking depreciation into account on his bike anymore, but we expect to pay for regular maintenance and consumables — probably another $500. So even just considering the $4,320 in parking charges, we stand to make a nice $3,000 deposit into our online saving account at least this year. Yea! 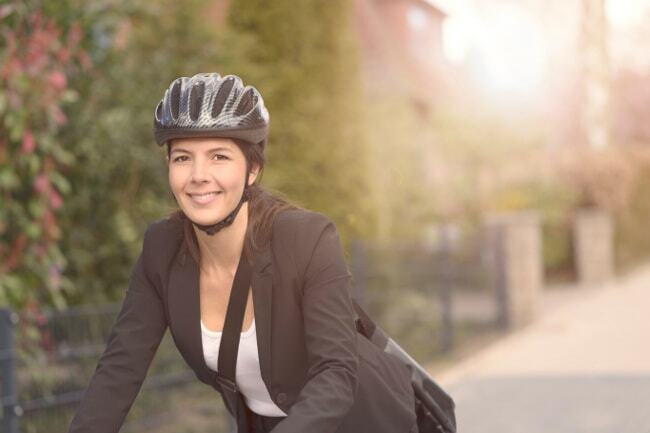 Have you considered commuting to work on your bike? What do you think you could save? 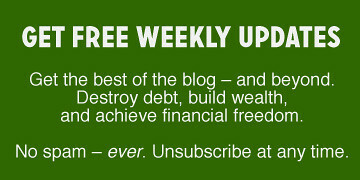 Would you do this to get out of debt or boost your savings? There are 36 reader responses to "Save money on your bike commute". Interesting post! Commutation cost can be curtailed and the bike can be long living. We need to know the correct ways to make it successful. Well i am sure that i am not going to be in debt for my bike.Sometimes I use public transport and give my bike a rest. Thanks for sharing the post. I personally enjoy my bike commute and highly recommend it. At 7 miles (one way) it gives you time to just think about what you are going to do or reflect on what you did that day. During rush hour you can easily beat a car into work. I do want to add a caveat, you need to remember that there are jerks in cars AND jerks on bikes. The majority of drivers and bikers are very nice, so when a jerk decides to act up try to brush it off (like you would if someone cut you off in a car). Two words — do it! I think you’ll be very happy you did. Let us know too. We’d love to hear your story! I use the bike or public transport. Indeed, my job is 6km far away. The idea of bike is to spend less and do more sport so I bought a cheap one: (70 euro from sportsdirect)+ protection hat + 2 consumables, the night vest is a gift; I use regular clothes and a light sacback to transport lunchbox and the clothes to change. In this part of Europe there are a lot of people using bikes (millions daily), and mainly people with small revenues: healthy and smiling people. Could be because of the bike, maybe…. The main issue is the stealing of the bikes, so I don’t buy an expensive one: it is a temptation. 100euro is all the money spend for my pink bike. I love the night vest idea. What a great gift idea! That’s another way to bring down the cost of commuting. Sorry to hear that theft is such an issue – though maybe having a pink bike would deter some thieves. As for myself, I think they’re pretty. This is a great post. I bike commute 5 miles per day and it saves me $4 in bus fare each work day. This adds up to more than $500 each year, even after accounting for bike maintenance, parts, and accessories. I completely agree with the author that it is worth it to invest in a good bike, quality parts, and clothes/accessories to allow you to ride safely all year round. My only advice is that for most riders, it makes a lot more sense to buy a complete bike (whether on Craigslist or in a bike shop) rather than buy the frame and components separately and then build the bike yourself. Buying a whole bike can be the same price as buying the parts separately. Also, DIY takes a lot of time, and some experience. Better to get a fully-functioning whole bike and get riding ASAP! I have to agree with you. DIY does take a lot of time and experience. I really do like your advice to find a solution that works for you — get a complete bike, like you say — especially if you’re starting out. Over time, you can start developing the ability to DIY. In the meantime, what’s really important is to get out there so you can start enjoying all the benefits! Wow, 35 miles round trip. Doing this would be crazy here in PA with all the mountains. It would take hours to get to and from work, if you could even make it. I like the bike idea, but maybe only in Arizona/ Flordia where it’s warm all the time. Jealous! Yep, we’re definitely committed *haha! It’s very important to be aware of weather no matter where you live, though. In the southern states, you have to be concerned about riding in the hot weather too! We live in a very hilly city in PA and my husband bike commutes a 35-mile round trip all 12 months. Not saying to be argumentative at all. Just want to point out that it entirely depends on what your tolerance is for weather and hills. He’s not a spring chicken, either. But there’s no such thing as bad weather, only bad gear! As a 20+ year professional bike mechanic and full time bike commuter, I can tell you that being frugal is wise, but finding a local shop and using it goes a long way towards developing a relationship with a mechanic you can trust. If someone buys a bike from us, we are going to take care of them no matter what. If someone comes in who has online shopped and nickels and dimes every single thing…well, you get what you pay for! If something goes wrong, or you are in a bind, that’s tough luck because you saved every penny you could and the local shop is now out of business. Stay local, maybe pay a little extra for good product, or good food, or good services. Try and outsource your mechanic online to save those pennies, good luck! But, that’s the American way, I guess. Not for me though! Hey, Everyone – Rusty has a good point. It’s important to remember that there is a trade-off to be made by trying to cut costs. There are lots of really great bike shops out there who make a big difference offering terrific service. There’s no discounting that! Thanks so much for adding your comment. It is important to support all the bike shops that keep us riding in fine form. Where’s yours? If someone wants a bike bad enough, they’ll figure out a way to take it. I’ve actually considered riding to bike, but my route would take me across bridges or ramps of a very busy freeway, and I’ve always been a bit fearful for safety reasons. So true, Michael. A lot of infrastructure is necessary to make commuting to work on a bicycle actually work. And safety is the #1 concern! Towns and cities are starting to invest in the necessary infrastructure, but there’s a long way to go. I bought a relatively decent Trek hybrid for â‚¬160 two years ago and still do all my commuting on it. Probably spent another â‚¬250 since then on rain gear, tires, repairs and the like. Can certainly be done successfully for far less than you outline, but for longer commutes you would certainly want better quality gear. Regardless, the savings are big for sure, not to mention the exercise. I take a tram into work when the weather doesnt permit in blustery Ireland! I biked to work for 15 years….fortunately it was just a 10 minute bike ride and I had a safe hideaway place to leave my bike at work. I loved doing it….a little bit of exercise without even trying to. My bike had several gears and after a few years I would have to have a tune up because the gear would not shift. After retirement I bought myself a round town bike that only has three gears….wonderful….have never had to take it in for a gear tuneup after 9 years of use and would not get a many gear bike again just for around town riding. Another option is to see if there is a bike co-op somewhere in your area. The bike co-op in my metropolis has everything from discount dept. store bikes to high end bikes. Of course different co-ops have different business models so how and what bikes they acquire may be different at different places. My co-op also lets you volunteer and earn credits which a certain portion of the bike price can be paid for with credits. Another great aspect of a co-op is that you can learn bike maintenance. From changing/repairing a tire, to full disassembly and re-assembly. 1. don’t forget to get a good helmet. 2. get a RoadID wristband or something similar. It has all your emergency contact info on a wristband just in case the worst happens. 3. if your ride at night, you can also get some reflective tape (ex. 3M scotchlight) and stick that on your frame or helmet or both. It stays on for a long time (3 year and counting). and I’d agree with the comment about doing business with your local bike shop (LBS). I’m lucky that mine is on my route and I’ve stopped in for help many times … and they are really good. I’ve gotten some free help to adjust my brakes/derailleurs, they fixed up my toe clips after they got wonky, etc. And they also got me a discount on a new bike after my old one got stolen. To me this post is kind of odd. If I decided to bike-commute AND my main goal was to save money, then I can’t imagine spending more than, say, $300 upfront for everything: Bike, helmet, u-lock, blinky light, etc. And then there’d be occasional costs like brakes & tires. If I had to bike through the rain, I could use the $20 waterproof sack I already have for camping, plopped inside a regular backpack. And so on. To be more clear: The post contains useful information, and I totally get it that the fancy gloves and clothes and a better bike etc. could be very worth it, to some people. It’s just that, given the nature of the website, it would make sense to at least also point out that, if a person truly wanted to or needed to spend very little, that’s definitely doable. Because think about: You’re talking about SAVING $300-1000 on a bike, but a lot of people wouldn’t even dream of SPENDING that much on it, you know? To those folks, the article comes off like the amazing money-saving tip “Stop buying Starbucks multiple times a week, and save hundreds of dollars!” I like this blog and hope it can contain posts that are useful to a range of people, including people completely unable to spend $1000 on bike stuff but who want to start bike-commuting right away. I work from home and my husband has a take-home car for his job, but we both enjoy bicycling. If our situation ever changed, commuting by bike is definitely something we would consider. Penny wise, pound foolish approach as usual. You need to skip the el cheapo route (how many dollars will you spend traveling to sales in “other counties” (seriously??) etc. Local bike shop, support it. I don’t think that shopping around is a problem, but you are missing out on the big picture: biking community. I’m not saying don’t get a pair of ortliebs online if your shop doesn’t carry them, but get grown up about shopping like a freaking teenager on Craigslist. Especially if you aren’t an experienced at home wrench. And all that crap about carbon fibre? Seriously? That’s written by someone who googled “how to buy a bike”. You don’t have to be a gear head, but cars are innately gear centric, just built in. I’ve been a commuter since the early 90’s. In a rainy, hilly area. I don’t spend a ton of time trying to buy the cheapest anything. I got a bike that FITS (sure f’up your lower back reaching over a too long top tube, or not knowing your seat height, or pushing through erectile issues b/c you bought the el cheapo seat). Buy good, working gear, clothing, etc. Bike depreciation is definitely NOT linear, so buying a brand new bike from a LBS is a great way to lose a lot of money quickly. Building a bike really isn’t necessary or necessarily even beneficial, especially for a person of average proportions who is trying biking out for the first time. As such, the price quote for “a good commuting bike” is at least $1000 too high. Bikes that are quite adequate and up to the job can be found in the $500 range, especially used ones on Craigslist. This is particularly true in a college town. Also, the type of bike storage at destination plays a sizable role in selection. Some people may not have good parking options at work and/or might combine biking with transit, leaving their bike at a train station, bus stop, or park-n-ride lot somewhere. Having a $1500 bike disappear is far more annoying than having a $300 bike disappear. A basic tune-up on a bike is not rocket science. A couple videos on YouTube and some basic tools will be nowhere near $100. If something is still fuzzy or needs a special tool, check to see if there’s a co-op/bike kitchen in the area. They will usually charge a couple bucks for shop time where one can go use their tools and pick their brains. Another number that could be at least a third lower. My favored tire is the Schwalbe Marathon Plus which comes in at around $50 each, but I only use them in the back. For fronts, most people can definitely get away with something in the $25 range, especially for those who don’t spend a lot of time pushing the limits of their bike or riding in an area with lots of wet/snowy weather. Front tires also last a long time, mine is pushing three years now. This category is pretty sensitive to the category above as the life of a tube greatly depends on what kind of tire it’s in and the riding environment. If they’re all nicely-paved trails, the regular ones will probably last quite awhile. But if there’s city riding involved, the thorn-resistant ones are probably more desirable, but they do also cost more. These three parts should probably be included in the “tune up” budget. Hopefully this is the section where a good lock is lumped? While in some places, just throwing the kickstand down gets the job done, most people will want to have one (or more) good locks on their bike while they’re away. Yes, and perhaps even a bit low, but hopefully they don’t have to be replaced annually. Make sure to take them inside to keep this expense from becoming frequent. Dynamo-powered options are also appealing, though hard to find. Though a good set certainly can cost twice this amount, these really shouldn’t require replacement annually, especially panniers. Certainly an accurate price for the category, but bike clothes can get expensive and really are hardly necessary, especially for those who don’t feel like making their commute into a HIIT routine. “Bike clothes”? I just wear what I wear to work. This is commuting, not racing. My rain jacket was $25 from Gander Mountain. My bike cost $420. I have a local bike shop 2 blocks from the office who do tune-ups, etc. I second the shout-out to local shops. How does one even spend $200 on lights? Given that they could be easily stolen, I am not sure that I would want to make that investment. Another piece of equipment to consider: My yellow vest with reflector panels was about $5 at Ikea. I commute by bicycle a few times a month (28 miles round trip) and have to be at work at 7 am. This means leaving and sometimes completing my trip with no daylight. $200 for a strong (1000 lumens) headlight and tail-light is not unreasonable. All decent models are USB rechargeable, can be easily removed to prevent theft, and put out some serious light. IMHO, that’s a small price to pay in order to see and be seen! I do work part time in a bike shop, so fortunately I get great discounts on all my cycling needs. Saving money is hard when prices keep going up. Therefore, you must be smart and resourceful enough so that even in your little way you could cut down your expenses. I never noticed how much money it would cost to drive to work and park, just to think riding a bike would save that much money, im interested if i can save more money by exercising i consider that a win win! Very interesting post, and good content. I just bought a used bike on ebay. This is definitely a good way to safe money! If someone is interesting in buying a used bike on Ebay, remember to look at the buyers recommendation. Great article – thanks for breaking down those expenses. I never realized exactly how much driving to work each day could cost. Even if you can’t bike to work (you live too far away), I highly recommend trying to set up a carpool if you live near other coworkers. Great subject for a post. I’m also appreciating all the reply’s. I don’t believe anyone here has mentioned the $ you will save if you choose this as your daily exercise instead of say… paying for a monthly gym membership or for an exercise class. For me that is the biggest draw with respect to saving money. I tried biking to work last summer as a personal challenge during ‘bike-to-work-week’ and really loved it. This event is sponsored by Bike to Work BC. On their website I’m able to find out how many calories I’ve burned during my bike commute as well as what my carbon footprint offset is… very cool and motivating to me. I’m also fortunate because my workplace (and university) has a shower room for use after biking (saves me more $ from my home expenses)and both also provide secured bike lock-ups. I would also not give into buying new equipment. Why? because I can’t budget it in… and why would I want to? I have a second hand bike that works! Purchased it off a nice lady on Kijiji for $100. And my biking clothes are what I would wear to the gym or yoga… multi-purpose. Sounds like you’re doing it the right way! As I already said in a comment, I think it’s bizarre that the article leans so much toward buying a bunch of new, fancy equipment, special clothes, etc. If you really care about money, you can get by without those things, or definitely at least at the start. Biking to work is one of those topics that brings to mind a Catch-22 of saving money: we moved out to the boonies to get the most value on buying a home. Now that we’re out here, public transportation is nonexistent and biking to work would be dangerous. Moving close enough to bike to work would require us to go back to renting a tiny apartment. It seems like making one smart money move always ends up costing you in other ways. I think bike commuting can be a lot cheaper than the amount listed if you have a short commute and don’t get as expensive stuff, though still good quality. I don’t bike in the winter because I live in such a cold snowy city and I don’t want to damage my bike, but for 8 months of the year it’s the fastest way to get to work and everywhere else. Invest in bike, in addition to saving transportation costs and still get good health as well. I’ve biked for over a year and I feel better than I’d drive before. I also feel relaxed and refreshed when I got home.